My girls have made a sidewalk chalk path that leads from home to the road that will ultimately lead them into the world. What I see is little-girl-lives-in-living-color lining a path on the driveway...colorful, whimsical, messy. My eye is drawn to the heart that is the center of the palmprint and know they will carry my love with them when they eventually go. Rain will wash the dust-path away, but memory-crumb path will remain to lead them home when the need arises or the heart longs to return to a mother's love. 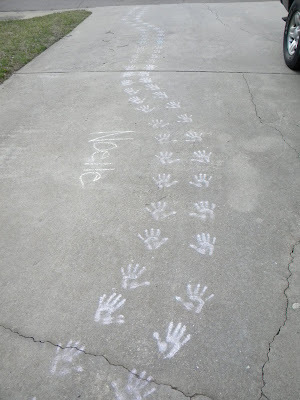 I smile that nearly teenage girls still delight themselves in sidewalk chalk and simple art. That they delight themselves in each other. Their handprints...stamped for a moment on the concrete drive, and forever in their mother's heart. Thank for posting & reminding that the little chalk princess in my house is growing up and out as well. L&D Part 3: Hello, Future!